Make sure to present your JPerks card in person when purchasing from our JPerk businesses. jPerks are exclusive benefits for JCC members. The following businesses have graciously agreed to participate in jPerks, special offers and discounts for JCC Members. Please check back frequently for updates, new companies and more services. If you would like to have your business represented on this page, please fill out a jPerks application and return it to Tracy Sussman. If you have any questions or for more information, please contact Tracy Sussman, Director of Membership and Marketing, at 610.435.3571 ext. 121 or [email protected]. Toll-free at 1.866.515.4747, Monday through Friday, 9am - 5pm EST. Contact Erika to place an order and receive 20% off one item AND if you schedule to host a small gathering you will receive one FREE item. Arbonne is a PURE. SAFE. BENEFICIAL botanically focused company, utilizing the best of nature to improve your life. Arbonne uses beneficial ingredients from nature to help you look and feel healthier. Arbonne is a synergistic which makes you feel great inside and look great outside. Arbonne's nutrition line is made with high-quality formulas helping to support your health and helping to feel incredible. Discount/Offer: Sign up for your complimentary Brooks Brothers Corporate Membership Card. Save 15% on regularly priced merchandise at all Brook Brothers U.S. and Canadian stores, by phone and online. Discount/Offer: Save 15% off services offers by Clotheszing. Wardrobe audits, personal shopping sessions and makeup sessions. Having worked in the fashion industry for 28 years, Clotheszing. Owner, Kathy Moses, specializes in wardrobe and makeup transformation. Learn to dress in the styles that compliment your body type and lifestyle, and make the most out of your current waredrobe. Save money by purchasing less, yet have more to wear. Discount/Offer: Get custom printed wall murals for your home or office. Use code CC50 for $50 off your order. At Coastal Creative we have your printing needs covered from conception to installation. Our employees strive to provide an unparalleled level of quality and service on every job we complete. We will always do our best to fulfill your needs and deliver your project on time and on budget. Making your brand or project stand out against the rest is what we do best! Discount/Offer: 20% off; Cannot be combined with any other discount. Your Comfort Suites Allentown has made considerable strides in improving the quality of hotel product and services and has been rated "Hotel of the Year 2015" by the Better Hotel Bureau. While staying at the Comfort Suites you will experience our Superior Customer Service, Renovated all suite Rooms and Bathrooms, Full Service Restaurant and Lounge, Complimentary Hot Breakfast Buffet, 24/7 Business canter and Fitness Center, Complimentary Shuttle Service to and from the airport and within a five mile radius, Four Meeting Spaces, and Complimentary High Speed Wireless Internet. During the summer months we sell out quick! Please call the hotel to take care of any reservations now so that you will have rooms when you need them. Discount/Offer: Corporate Shopping Member Discounts connects member to over 250 top national retailers offering incredible employee discounts and private offers. Discount/Offer: Go to the Official Crayola Experience Store and enter CODE: lvjcc to receive your discount on your ticket. DECEMBER 20th - Don't miss this ultimate holiday combo ticket! 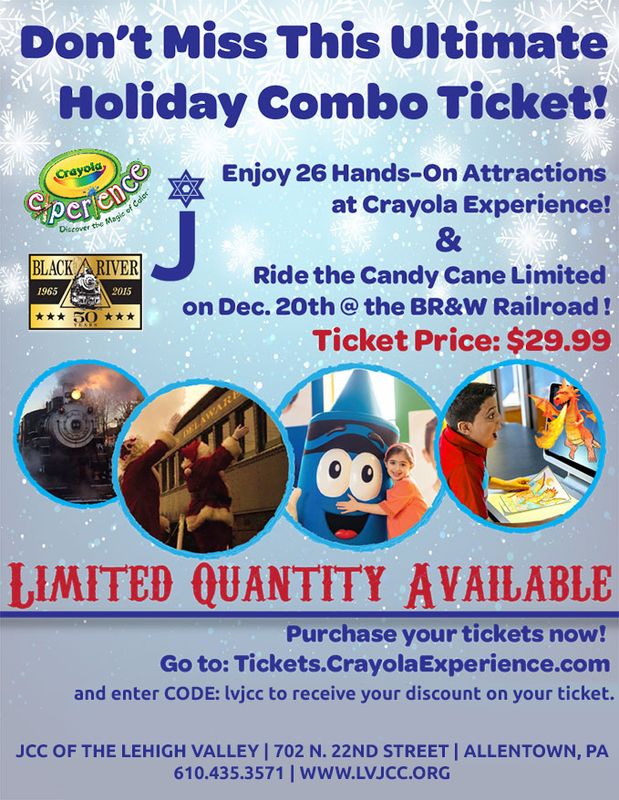 Enjoy 26 hands-on attractions at Crayola Experience and ride the Candy Cane Limited on December 20th at the BR&W Railroad! Ticket Price is $29.99 through the above code. Click here for more info. Discount/Offer: 15% off your Creative Closets® purchase. This includes installed or self-installed materials. Not valid with any other offer or discount. We create organized spaces. From ventilated wire to melamine to solid wood built-ins, pantries, dressing rooms, home offices, garages, wine cellars and more. Discount/ Offer: Let Dan’s Photobooth provide the fun for your guests. Rent the photobooth for your next occasion to capture fun, spontaneous, & memorable images plus receive $100 off a 3 hour or more Photobooth Rental. Established in 1977, Dan’s Camera City offers superior customers service, selection and pricing on all items related to photography. Cameras, accessories, cutting edge imaging products, classes and much more are offered at Dan’s locations in Easton and Allentown. Rated number one nationally and locally, Dan’s employs over 60 full time professionals serving the needs of amateurs, professionals and businesses. Discount/ Offer: Present your JPerks card to receive a 15% discount off your bill. Does not apply to alcohol or special Happy Hour pricing. The Dime is an upscale dining experience like no other. Our menu features locally inspired and locally sourced Pennsylvania American cuisine. Our inspiration comes not just from our own Lehigh Valley, but from all regions of the state, including, Lancaster County, the Greater Pittsburgh area, historic Philadelphia and a continually evolving list of culinary landmarks. Our dining spaces are a timeless and elegant homage to the Lehigh Valley's rich history as well. The Dime's full-service bar features Pennsylvanian specialties among its extensive list of craft beers, wines and made-from-scratch cocktails. And our incredible assemblage of renowned chefs and restaurant professionals will ensure that every meal with us will be among your most incredible and memorable dining experinces. Discount/ Offer: Visit www.dorneypark/JCCAllentown to receive $15 off admission. Ready for some FUN at Pennsylvania's premier amusement and water park? Enjoy exclusive savings on admission tickets to Dorney Park & Wildwater Kingdom as a valued employee of Allentown Jewish Community Center! Grille 3501 literally stands alone with its "sophisticated yet unpretentious" atmosphere and menu. Our unique blend of Asian, French and Mediterranean cuisine, combined with our warm hospitality and attentive service will make your every visit to Grille 3501 an event to remember. The Loft as 3501, a new addition to the Valley's favorite restaurant, provides guests with a unique dining experience in the West End by offering patio and open-air dining along with the same great award-winning menu favorites. Happy Paws has been in business since 2008. We are dog walking and pet sitting services from the comfort of your own home. Jessica Newman, owner, has a bachelors degree in animal behavior, training, and enrichment and ten plus years in animal related experience. Just across the bay from New Jersey sits the pristine beaches of Delaware. Located just 2 miles west of the beach, Heron’s View at Mallard Lakes in Fenwick Island, DE, is your home away from home at the beach. We invite you to enjoy our waterfront vacation retreat just 5 minutes from Delaware and Maryland beaches – 2 bedrooms, 1.5 baths plus an outside shower in a family friendly community. We offer nightly, weekend and weekly rentals for up to 6 guests. Read guest reviews here. Discount/Offer: 15% extra discount for JCC members over already discounted prices. Complete stationary and invitation source. Custom calligraphy available. Serving the Lehigh Valley for over 20 years. 3 Months Free on PO Box Rental, or RPRS. Annual contract (new accounts only). Located behind Wert's Cafe, next to Jimmy's barber shop. Lehigh Valley Mailbox - Print, Pack, Ship. We offer PO Box Rental, Virtual PO Boxes, and our Residential Package Receiving Service (RPRS). Instead of risking having packages stolen from your doorstep, for $9.99/Month, send your packages to LVMailbox and receive a text notification when they arrive. LVMailbox also offers wide format printing including; banners, stretched canvas, wall clings, dry erase, etc... Shipping services include FedEx, UPS, DHL & USPS. Discount/Offer: Visit Louie’s for 10% off your entrée. Excludes tax, tip and alcohol. Louie’s is family owned and operated by the Belletieri family since 1958. Serving great Italian food with good service to the Lehigh Valley and hopefully your family too. IT services and support from Micro-Innovation. Business today runs at the speed of information, and the companies that can keep up will have infinite possibilities for growth. Micro-Innovation offers comprehensive IT services and support that are designed with productivity and your bottom line in mind. Our IT computer services are renowned for their reliability, 99%+ uptime and positive ROI. Discount Offer: Enjoy 20% off of frozen yogurt purchase and $5.00 of a Menchie’s Froyo Cake. Discount/Offer: 15% off regularly priced frames. Bring your jPerks Card and get 15% off any regularly priced frames. We are a family owned business. Opened in 2009, we've gladly helped people see better for over six years. Discount/Offer: Call and tell us you heard about us through the JCC jPerks and we will give you 5% off any purchase. Discount/Offer: 10% off; Offer valid on local deliveries, no other discounts apply. Not valid on party work. See store for details. Discount/Offer: Save 10% on any marketing or promotional service/product. At Sunburst Marketing we strive to develop innovative solutions for our clients' distinctive marketing challenges. We specialize in branding, graphic design, web design, printing, and promotional products. We are excited to present our first fall release, which includes 15% off on all Football tickets, $15 off with UBER, up to 30% off Movie tickets, and loads more. And don't forget about Monster Bucks, which provides cash back on all purchases. Click here to see more. Discount/Offer: 20% discount on any tuxedo rental or purchase. Not valid with any other discount or offer. ...More to come. Keep checking this page for an updated list of participating businesses.